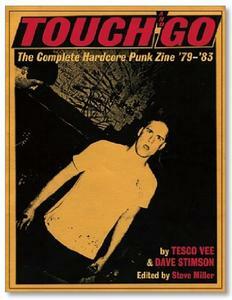 Tesco Vee and Dave Stimson who started the independent record company Touch and Go, originally began their venture by producing hand-made fanzine publications of the Midwestern punk scene in 1979. Touch and Go is a hefty volume, rounding out at more than 500 pages and includes all 22 original issues published two decades ago. Introductory essays by Henry Rollins, Peter Davis, Corey Rusk and other highly respected individuals from the punk scene initially gives the sense that this publication, while short lived, was in its own right an important part of the scene's past. The Touch and Go fanzine was a sort of beacon of light glowing out of the little known Midwestern music scene. A documentation of a broader culture that was starting out at the time with bands like The Misfits, Black Flag and a number of other incredibly influential bands. 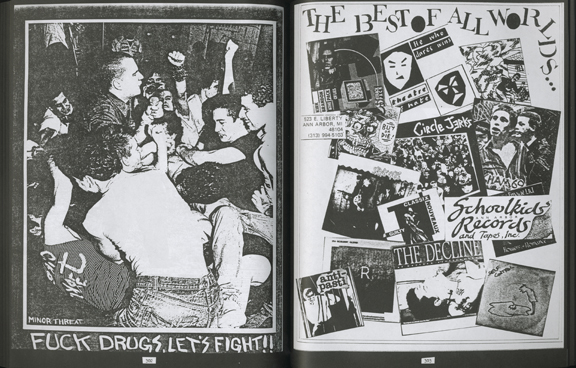 I am not going to pretend to know much about punk music, and am not sure if anyone at photo-eye is a qualified scholar, but I do pay attention to book design and content and Touch and Go is a really great resource for the upbringing of a rich cultural movement… as well as an interesting collection of early fanzine publications. There are great number of reviews of many bands and their singles. While Joy Division may get a positive review in one issue, the same issue is not as kind to the Psychedelic Furs. The informal and candid reviews immediately lead me to think of more contemporary album reviews such as those in Vice Magazine. There are also a number of cartoons, promotional posters and collage intermittent throughout the entire catalogue, leaving you with the sense that Vee and Stimson weren’t only musicians and music critics, but visual artists as well. Touch and Go even features music that was not only punk, but also just different for the time. The Cure and U2 both have pieces within the pages of the catalogue and showcase a rather diverse selection in what was up and coming and alternative at the time. The full collection of these fanzines turned into a fun and informative read, a little part of music history I found to be worth engaging. Selected as one of the Best Books of 2010 by Michael Schmelling. Purchase a copy of this book here.